HELP FOR OUR NEEDIEST STUDENTS: Did you know -- our Cougar Cash MMS School Store isn’t just fun for all kids but also importantly serves our food insecure students by helping to bridge the gap between free school-provided breakfast & lunch and home. But we need the help of the parent community to keep the store fully stocked with after-school snacks. Would you consider donating some funds or items to help ensure the store always has a full inventory? A list of the most popular items can be found HERE and anything you purchase can be dropped in the main office. Or you may donate some funds -- drop a check in the HSA mailbox in the main office with a notation that it’s for the school store or use our Pay Pal account HERE, again with a notation directing the money toward the store. And thank you so much for helping to serve ALL our children. YOUTHNET IS STARTING AGAIN: The Winter session of Youth Net clubs is starting this week and there’s still time to sign your student up for these amazing classes! It’s just one $40 fee for multiple clubs. And no student is ever denied access for financial reasons. We are so lucky to have Youth Net in our community and to have our incredible MMS faculty teach these courses. Check out the current brochure HERE and encourage your kids to participate! MMS CHOPPED: Speaking of Youth Net, Ms. Silva’s cooking club “MMS Chopped” can use your donations. She’s really short on supplies and wants to give the kids the best possible experience. Have anything cooking-related that you can donate? She’ll take anything! Ideas are: microwave, blenders, measuring spoons, toaster oven, griddle that plugs in, hot mitts, aprons. Please contact Ms. Silva at dsilva@somsd.k12.nj.us if you’re able to help. And thanks! MATH COURSE SELECTION MEETING: The school district is hosting a math course selection informational session on Wednesday, March 8th from 7pm-8:30pm in the MMS library for families with current 5th-7th graders. Come hear about the math & science courses offered at the middle school and high school and get all your questions answered about levels, prerequisites, summer options, access & equity, and more. All info can be found HERE. CONGRATULATIONS MMS ODYSSEY OF THE MIND: In its very first year at MMS, our Odyssey of the Mind team came in 4th place out of 17 teams. Our hard working students should be congratulated and acknowledged for their commitment and placement. This terrific team consisted of 6th grade students Owen Holt, Max Lombardi, Charles Rosenberg, Alex Shubart, Jonathan Smith, and Sam Zaslow-Braverman and their faculty advisor was Mr. Kaplan. And a huge thank you as well to MMS parent Emilie Zaslow for all of her hard work and effort in bringing this club to MMS. Well done, everyone! 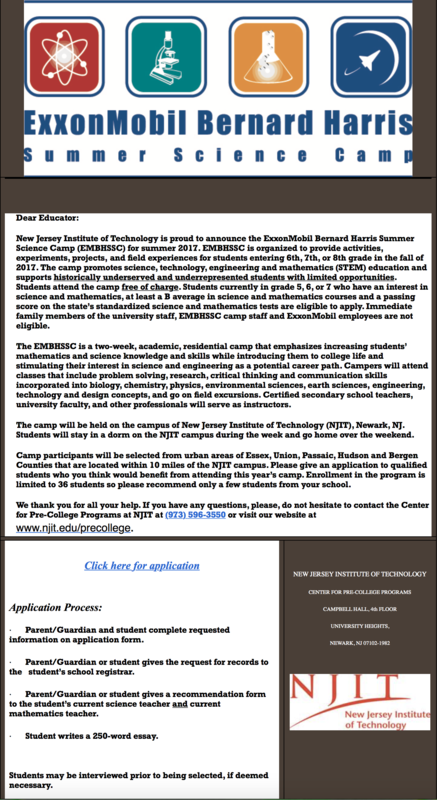 NEW JERSEY INSTITUTE OF TECHNOLOGY SUMMER SCIENCE CAMP: Please click HERE for all of the info on a selective summer science camp opportunity for middle schoolers. Click HERE for the application. Thanks for reading! Have a great week and stay warm!